For me, one of the most exciting parts of being a parent, is sharing the things I love the most with my children in the hope that they too will love them as much as I do. 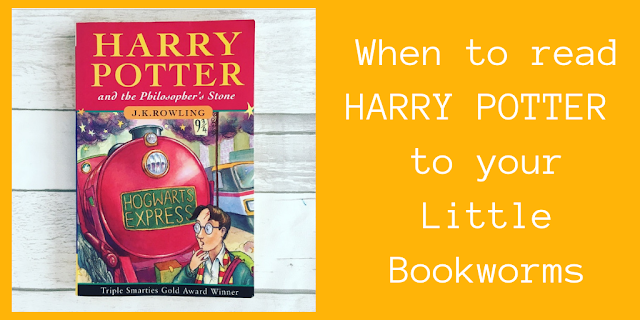 I know my husband agrees with me about this wholeheartedly and, as we are both big Harry Potter fans, we have been looking forward to sharing Harry's adventures with our own children for quite a while! At 2 Poppy is obviously much too young to understand the themes within the Harry Potter stories. In all honesty she initially thought the book was about Harry Kane! However, once we got that straightened out, she seemed to quite enjoy the bits she did understand. In any event she demonstrated some great broomstick skills during story time and I think if she ever gets her letter from Hogwarts, she will be a natural at Quidditch! At 4 Theo understood most of what was happening in the story and did enjoy the book but at times I still had to stop and explain things to him and he also got quite distracted during story time. Whereas Izzie at 6 (nearly 7) LOVED the book, she was keen for me to read it as quickly as possible. She is quite a confident independent reader now and occasionally read parts of the story herself but she couldn't read it quickly enough to satisfy her need to discover what happened next. In fact my voice struggled to read enough aloud to keep her happy and Daddy did at times take over with the narration! I would also add that none of the Mini Reviewers were particularly upset by any of the themes in the book so maybe I had been overthinking that part! The reading age for the Harry Potter books I believe is 9+ and as Harry Potter himself is 11 at the start of the books and about to start secondary school, some of the language and themes are going to be a little mature when you are reading to young children. However the sense of magic and adventure can be enjoyed from a much younger age and so if, like me, you are keen for your children to experience the books before the films, we recommend Harry Potter at story time for children from around 6 years and upwards. However, do please use your own judgement as you know your own child the best! Reading the story aloud for the first time was absolutely delightful, although I admit I struggled with Hagrid's dialogue! I am sure that everyone who is reading this, is familiar with the Harry Potter series but, if you haven't read the stories for a while, I really do recommend picking them up again as they are simply magical even for grown ups! We are now really looking forward to joining Harry on his next adventure: Harry Potter and the Chamber of Secrets. I may have my eye on this beautiful illustrated edition (see link below) and I am also keen to read the newly released edition of The Tales of Beedle the Bard illustrated by the amazing Chris Riddell. *This post contains Amazon affiliate links. This means if you complete a purchase using the link within a certain time frame, we receive a small amount of money but at no additional cost to you. We love the Harry Potter books here. My teen is re-reading them again at the moment. My kids had to rely on the films as I just couldn't get on with Harry Potter. We read the illustrated version of Harry Potter and the Philosophers' Stone which is beautifully illustrated. My daughter was quite scared of the Voldemort picture so we decided to read the chapter books without illustrations so that she could imagine the characters for herself. I've stopped my 9yr old at the end of third book as I decided the themes were too grown up beyond that. I couldn't wait to share Harry Potter with my boys but I half off with my eldest until he was 6 because I didn't want him to not get it and be turned off. Now we are 50 pages from the end of the philosopher's stone and he can't wait to finish it! I love this Kate! Very well thought out. My concern is what do you do when they get hooked but the later books are too mature for them? I can't wait to read Harry Potter as a bedtime story, we have the first three illustrated editions ready and waiting. I know that it will be a few years yet for us, I think 8-9 will be when we start to read the first books to our daughter. There are so many books I can't wait to share with my girl. It's definitely the best part about being a parent.